Whoops, now see, that one got away from me...but just take my word for it...she's a little piece of heaven...very alert, smiles all the time, and sleeps well! 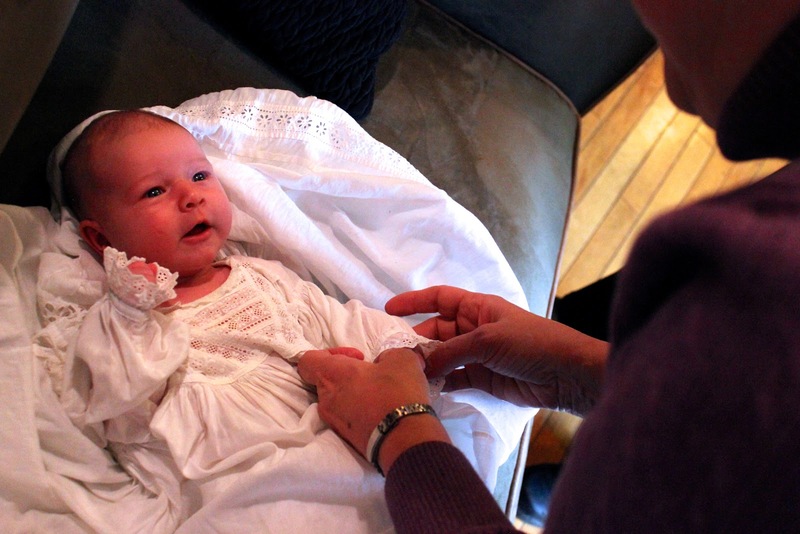 We blessed her this weekend...in our home...surrounded by family...wearing this 100+ year old christening gown. That should've really been the headline to this post, but I'm still not that focused mentally right now enough to write Pulitzer Prize-winning posts just yet. Anyway, the blessing that Steve gave to Honor was really wonderful and sweet and special. It captured everything that we hoped for her and then some. Honor is a very special little person with a bright future ahead of her, and we are most excited to help her reach her destiny as a righteous daughter of God. I have to say one more thing about all of the wonderful friends who have helped me out during this time. Many, many people have brought us dinners, provided babysitting, rides home from school, or simply called to check in and offer help in various ways. One day last week, I had seven women stop in with food or offer to take my kids or provide rides....seven women all in one day. One friend even showed up at my door with all of the ingredients to make me dinner, then helped me clean up and prepare food for our big blessing weekend. But what I realized the evening that I had received so much service from others was that sometimes our Heavenly Father facilitates a big display of love in our direction simply to show us that He can. It's like he's saying, remember who I am...I am the most powerful, most compassionate, most omniscient being in the universe. I can take care of you...and I will take care of you, and it is no sweat for me to do so. My brother-in-law Gary and his wife Emmalee had a baby this summer. They named him "Cedar Jedi Christensen." I love the little explanation of the name that they sent us with his birth announcement. They told us that Jedi is a Hebrew name that means "God sees and God protects." I am reminded once again that God does in fact see and does in fact protect. And for that I am most grateful. Congratulations! She is beautiful! What a blessing to have so many wonderful friends! It is a blessing! Thank you! Gorgeous gown, gorgeous family, gorgeous baby, and she looks like she belongs. 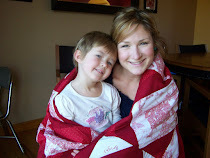 I love the idea of a "big display of love" and am so happy for you that you were the recipient of it. May you always feel that way! Yes, gotta remember this for sure! I am always impressed and inspired by the good examples of Christ's disciples and prophets in the scriptures when i read it. And i am always impressed and inspired by your good examples, your words and wisdom. Beautiful family, beautiful baby,beautiful testimony, beautiful YOU! Thank you, Cherry! Hey, are you going to come down and visit us this Christmas??? You can feel the love and joy just looking at the pictures! There was a family in our old ward that used a blessing/christening gown that had been in the family 100+ years too. They used it for boys and girls. They had five boys so every time another son was blessed the dad made sure everyone knew it was a gown and not a dress. You totally deserve it! And four kids is a handful (or two)=) I had my fourth in Iowa and people from church who didn't even know me still brought food for us. Such a blessing to know God has set up a wonderful society for us all!! Love your sweet girl.